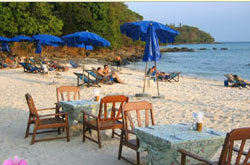 TThe Bay View Resort consists of split level bungalows situated on the hillside of the Laem Hin beach and surrounded by thick trees and gardens. 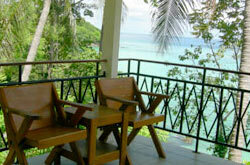 From the bungalows you have a panoramic view across Tonsai bay and of Phi Phi Lae Island. 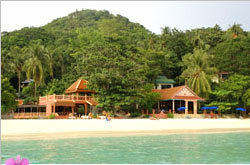 At the front of the resort lies a 380 meter wide pure white sandy beach. 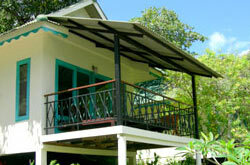 Our bungalows provide enviable comfort and privacy whilst offering the best views available on the island. 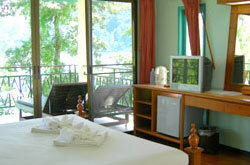 All rooms feature private balconies overlooking spectacular blue sea and are surrounded by natural jungle. 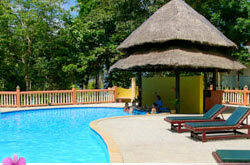 The most important aspects of the resort is the LOCATION. 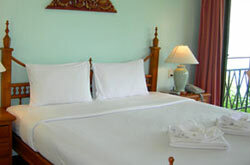 Outstanding views are realized from most bungalows because of the hillside location and the resort is at the quiet end of a long beach but only 15 minutes walk from the pier and the heart of the village. Therefore guests can enjoy a relaxing quiet beach holiday with outstanding views but still have access to many other restaurants, shops and activities. 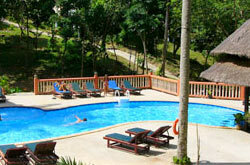 Superior and Deluxe Villa are 34 sq.m. 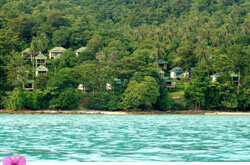 Grand Deluxe Villas are 37 sq.m.